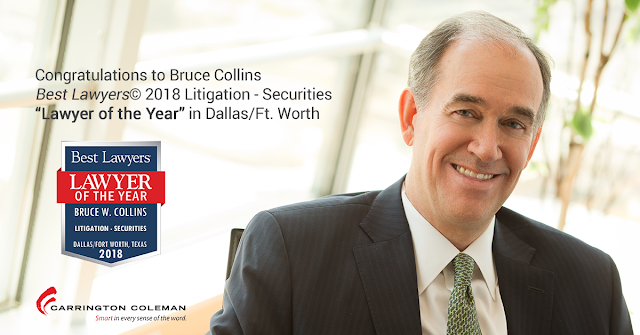 Bruce Collins received the honor of being named by Best Lawyers© 2018 as the Litigation – Securities “Lawyer of the Year” for Dallas. Based on peer-review surveys, the legal guide designates a single lawyer per practice specialty in each geographic region. Honorees received high praise for legal prowess, integrity, and professionalism. Along with being recognized for his Securities Litigation practice, Bruce was also named in the 24th Edition of The Best Lawyers in America© 2018 for his work in Commercial Litigation and Litigation – Regulatory Enforcement (SEC, Telecom, Energy). Fifteen additional Carrington Coleman attorneys were selected by their peers for their excellence in 22 different practice areas. Click to view the complete list.